‘War on business’. ‘Using taxes as their bullets’. ‘Declare war on growth in our economy’. ‘Toxic taxes’. 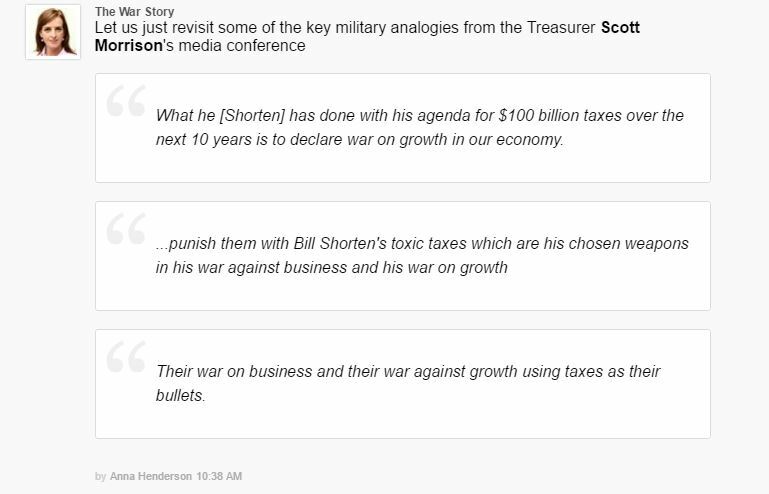 ‘…chosen weapons in his war against business and his war on growth’. Of course I don’t know what’s happening behind the scenes of the Turnbull election campaign. But I can guess. Judging by the ramping up of the class-war rhetoric displayed in this clunky over-reach example, I predict there is a mixture of panic and on-the-run strategizing going on because the old tricks are failing. I think the Liberals are scrambling for something tougher, harder, with more cut through because the old-reliable lines aren’t working. Perhaps I give them too much credit, and perhaps their class-war language is just a coincidence. However, I’m guessing Turnbull’s Liberals have been spooked by Labor’s positive campaign, and the positive impact this campaign is having on Labor’s popularity in the polls, and they’re scrambling to stem the tide. I think the Liberals have worked out they’re losing the argument. A focus on national security through bashing boat people. The Liberals jumped the shark by trying to tie the arrival of asylum seekers to Australia’s economic problems – epitomised by the community’s aghast reaction at Dutton saying boat people will simultaneously steal jobs and languish on the dole. This strategy no longer works because the ‘asylum seeker’ frame has been extended to ‘immigrants’ and we are a country of immigrants, many of whom are incredibly proud of arriving in this country with little English and nothing more than determination to succeed, and don’t appreciate Dutton stamping on their achievements by implying they leaned their way to prosperity. The dog whistle is broken. A reliance on the idea that a Liberal government manages the economy better than a Labor government so even if you don’t like Liberal’s social policies, you’ll still back Liberals because the economy comes first. Shorten is slowly yet surely breaking this narrative through his newfound determination to remind everyone that you can’t have economic growth without a strong community underpinning economic demand. I wrote about this last week, but in a nutshell, without government investment in education, health, wage defence, environmental protection, a proper social safety net, infrastructure such as the NBN and public transport and so on, the economy doesn’t have a foundation on which to grow. It seems like Australia is waking up to this idea, helped on by the failure of trickle-down economics to provide any benefit to anyone except the top 1% and the understanding that a tax-cut for companies at the expense of social investment is hindering, not helping the economy. Amen to that! In having discovered neither of their two key-election-winning-pillars working, like superheroes who’ve lost their super-powers, the Liberals are in desperate search for a new strategy. Because they’ve been left with nothing. At the very same time, neoliberalism has been declared dead, or at least slowly bleeding to death. So you can see why the Liberals have reached panic-station point and are wishing they’d never called a double-dissolution election in the first place. Diddums. In the leaders’ debate on Sunday night, Turnbull’s most used word was ‘Labor’. The thing the Prime Minister wanted to talk most about was the Labor opposition. This decisively proves Labor is setting the agenda this election and the Liberal’s panic decisively proves they have worked this out. The Liberal’s response to this panic has shown they don’t have the innovative, agile culture Turnbull likes to claim they do and so rather than come up with anything new, they’ve fallen back onto their oldest strategy: demonising Labor and screaming CLASS WAR! CLASS WAR! CLASS WAR! There’s a major flaw in this plan which no doubt, due to the panic and the lack of other ideas, hasn’t been considered: the cries of class war play right into Labor’s hands. Shorten can calmly, and even smugly if he likes, say ‘yes, you’re right. There is a class war. Your company tax breaks have proved which side you’re on. And everyone else is now fighting back. This election is our chance to put an end to unsustainable inequality, and instead grow the economy for everyone’s benefit. Who’s with me?’ Bam. The LNP and their parasite corporate mates are on the way out. Could it be that Malcolm might actually not surpass George Reid in the “shortest time in office of an Australian Prime Minister stakes?